A few reasons DuPont's stock could rise in the coming months and years. When investors think of a company founded in 1802 that is still wildly successful today and remains a major component of a large stock market index, they might have certain expectations for performance. It's important to remember, however, that no matter when a company was founded it must still compete in today's markets, which have vastly different operating conditions than those at the turn of the 19th century. That could partially explain why DuPont (NYSE:DD), the second-largest United States-based chemical manufacturer by market value, has struggled to outrun the S&P 500 in the last decade when dividends are included. DD Total Return Price data by YCharts. Although larger companies can take longer to respond to changing market conditions, investors should be comforted to know that DuPont's management is moving assertively to reduce risks, introduce efficiencies, and target future growth opportunities. Here are three reasons that DuPont's stock could rise in the coming months or quarters. You might think climate change presents only risks to the business world, but there are sizable opportunities as well in monetizing those threats. DuPont is well ahead of the curve. Not only does the company acknowledge climate change in its 10-K, but it's already thinking of ways to profit from and turn back the phenomena by helping customers remove what may be thought of today as unnecessary costs. To be clear, the company does not currently derive revenue from carbon dioxide manufacturing (the subject of the link), but in 2012 it did collect $2 billion, or 5.7% of total revenue, from products that helped direct and downstream customers reduce greenhouse gas emissions. The company does voice its concern with a lack of federal efforts to combat emissions in the United States for fear it will have to comply with many fragmented state mandates. However, the opportunities presented by reducing emissions could more than offset any potential effects from potential (and unlikely) state-by-state regulations. Besides, the company's robust and growing industrial bioscience division makes it a prime candidate for developing or acquiring a biocatalytic carbon dioxide manufacturing platform. It already has robust transportation, logistics, and sales networks for moving bulk chemicals -- making carbon dioxide, considered the next big manufacturing feedstock, an easy potential growth opportunity. In 2011, DuPont acquired Danisco for $6.4 billion, which increased total sales for the year by $1.7 billion, or 5%. The future opportunities for the acquired food, nutritional, and chemical assets are much greater. The acquisition was based in large part on Genencor, one of the world's leading enzyme manufacturers, which develops bioproducts and engineered biocatalysts (enzymes) to increase the production efficiency of animal feed, biomaterials, biofuels, carbohydrate processing, detergents, foods, personal care products, textiles, and more. Investors can consider the large amount of work left to do in industrial enzyme market development as a headache or as untapped growth potential. I'd choose the latter. Industrial biosciences in 2013 may have only reeled in revenue of $1.22 billion, or 3.4% of total sales (nutritional assets were reallocated to other business segments in 2011), but DuPont is uniquely positioned for growth in a world increasingly turning to biological manufacturing. In fact, the bioeconomy quietly accounted for 2.5% of American GDP in 2012. The business only has a handful of major competitors for industrial enzymes, including DSM, Novozymes (known in the courtroom for patent disputes), and Dyadic International (which licenses technology to customers such as BASF and Abengoa). And while start-ups pursuing novel platforms or more focused businesses could pose future competition, especially with constant advancements made in synthetic biology, the slow pace of advancement in industrial enzymes essentially makes the market a race among several horses. Can DuPont elbow its way to the front? In October 2013, DuPont announced that it planned to spin off its performance materials segment as soon as 2014. The business in recent years has witnessed volatile earnings and steady declines in total annual sales. Sales volumes and selling prices have swung up and down in alternating fashion for each of the last three years while bringing top and bottom lines along for the ride. Revenue and operating income plummeted from $7.8 billion and 27% in 2011 to just $6.7 billion and 14% in 2013, which has weighed down the company's overall growth trajectory. There are numerous opportunities within performance materials, but DuPont simply isn't getting it done with its current strategy. That makes a potential spinoff -- a tax-free spinoff -- an intriguing option for shareholders looking for value creation. However, management announced in May that it is also evaluating spinoff alternatives, such as a Reverse Morris Trust, which provides added financial flexibility. A Reverse Morris Trust would allow DuPont to spin off less desirable assets to shareholders tax-free, then merge or partner the assets with a smaller company; that would result in shareholders owning a majority stake of the new business. It takes two to tango, of course. The first target for a Reverse Morris Trust is believed to be titanium-dioxide manufacturer Tronox (NYSE:TROX), which could merge its $2 billion valuation with the titanium-dioxide assets of DuPont to capture $1.6 billion in operating losses that could be applied to tax obligations. Similar ultra-value creating strategies could be deployed for remaining performance materials assets with a win-win outcome for shareholders. DuPont shares could rise as the company sheds volatile businesses, while new value would be injected into smaller existing businesses. 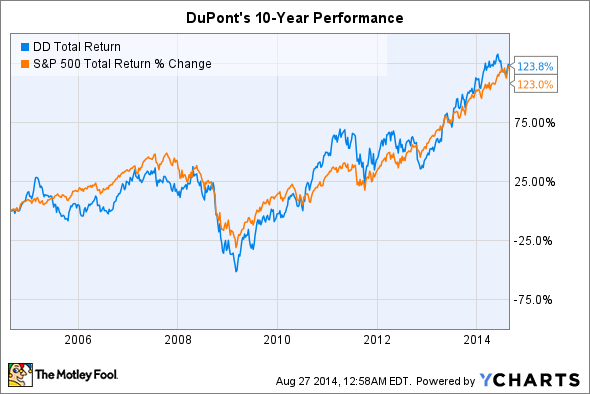 Investors cannot be blamed for being optimistic about the future of DuPont, despite the fact that it has raced the S&P 500 to a virtual tie for returns over the last decade. A focus on monetizing climate change with novel solutions, developing business that grow rapidly with the bioeconomy, and relinquishing less desirable assets in ways that return maximum value to shareholders are three solid reasons DuPont's stock could rise.